Anyone interested in developing cross platform UI? Post subject: Anyone interested in developing cross platform UI? First of all, I'm not a UI expert. But I do think we need a cross platform UI for Windows, Linux and Mac. At least in Mac OS 10.11, I can't compile UI with 10.11 sdk. But I can compile command line BasiliskII without any issues. I'm thinking about writing a simple but ugly Python tkinter UI to wrap up command line and also save/load configuration. I have no windows box. I'm not sure if I have a complete list of parameters. I need to dig further in source code. Post subject: Re: Anyone interested in developing cross platform UI? There is no cross platform BasiliskII , so why try to make a cross platform GUI? Not only some parameters differ between platforms, but also the prefs file name and location. At least in Mac OS 10.11, I can't compile UI with 10.11 sdk. You are aware that BasiliskIIGUI builds exist that run fine in OSX 10.11? The 2013 build by vasi will also support sparse bundles. For developers, we will have stable development tool set and dependency library. Eg, fixed gcc version to resolve jit. There is down sides: I'm not sure if the speed and sound can handle well in virtual machine. I will give a try and let you know. I had binary one. I really appreciate your efforts to share with others. But I want to make a modification. The sourcecan't be compiled in modern OS. That's a serious showstopper to BasiliskII project. If we don't find a way out, sooner or later this project will die. I have been working on a few - for Sheepshaver and Basilisk ( and PearPC on PC only ). I am not sure whether to release them to others, as they need more testing. You can run multiple machines, but on the Mac ( running a VM Yosemite as I have no "real" Mac ) you can run in single mode fine, but if you run in multiple machine mode the program does some dreadful hacks to the binaries to make the nvram and prefs files unique. It is written in Real Studio/Xojo, so should be able to compile for Linux too, but that is a bit beyond me. The prefs file location can be indicated on the command line, so isn't an issue. Thanks for the info - I wish I had seen that a while back. I will look into using your info when time allows. PS - does that work for Sheepshaver too? On OS X, you can create SheepVMs which contain all the data; I haven't looked to see whether those bits are fully available on other platforms. But you can definitely define the name/location of both the prefs and xpram file in SheepShaver. I do a similar thing in PearPC by always running the Windows 0.5 release in WINE on all platforms. Basilisk II. You can specify the prefs file on the command line, not the nvram. Your method in the post you referred to provides a workaround. SheepShaver. A virtual machine system has been implemented. Outside of this method you cannot specify prefs or pram/nvram on the command line and are stuck with these being hidden files in your HOME folder. If you DO use the vm system, these files live in the vm bundle and life is rosy. Except that you cannot run more than one vm at a time so I am not quite sure what the vm system achieves other than allowing storage of multiple configurations. Personally I have no need for "self-contained" machines, but wish to have several configurations and possibly more than one simultaneous machine running. So for now I am going to continue with my hack-the-binary method. What we really need is for someone capable to modify the sources to put the prefs and pram files in the same folder as the executable by default rather than the HOME folder, or at least allow them to be specified on the command line, for both emulators. SheepShaver. [...] If you DO use the vm system, these files live in the vm bundle and life is rosy. Except that you cannot run more than one vm at a time so I am not quite sure what the vm system achieves other than allowing storage of multiple configurations. You cannot have multiple VMs running while trying to run them with the same SheepShaver.app at te same time. But when you have multiple copies of SheepShaver, you can have each VM running with a different copy of SheepShaver at the same time. You can drag a VM on a copy of SheepShaver, or use 'Open with...' from the Finder's contextual menu, or you can create a script that will open each VM with a specific copy of SheepShaver. Use your imagination. Last edited by Ronald P. Regensburg on Thu Aug 11, 2016 11:16 am, edited 1 time in total. Yes I read that - I was quite intrigued! Clever workaround. The VM will not necessarily use the SheepShaver application inside. Create the disk image that will be the Mac OS startup disk inside the VM package. I have to admit that at this point I am not attracted to the vm method, but that is personal opinion. My one attempt at opening more than one vm at one time resulted in the second instance being rejected. I'll look at what you say above, though, and try again. The guide was written for the average noob user, not for inquisitive minds. That supposes starting a VM by double-clicking its icon as most users would do. A VM behaves as a SheepShaver file. If the VM is double-clicked, OSX will launch the SheepShaver.app that Launch Services has appointed to be the preferred application to open that kind of "file". Usually that is the last SheepShaver copy that is installed on that Mac, whether inside a VM or not, or whether inside that VM or inside another VM. If a second VM is double-clicked while one instance of SheepShaver is already running, OSX will not launch another SheepShaver copy. The preferred copy of the app can be changed in Finder Info for a VM or for all VMs, as you will be aware. That supposes the VM to be portable. Otherwise, the only files that need to be inside the VM are the prefs file and the nvram file. If the VM stays on the same machine all other files can be anywhere and pointed to in prefs with full paths. Thank you - that is very useful info. If you don't want to go the direction Ronald and I went and have a unique executable for each instance, use the "open" terminal command on OS X. -n flag will open a new instance of the program, and using -W allows you to pause until the program has stopped running before continuing execution; useful for nvram cleanup when you shut down BII. Of course, the method for doing this differs on Linux and Windows, so you'll still need to do a bit of environment checking to make this appear cross-platform. Thank you. You are all incredibly patient and helpful and I appreciate it. Especially patient with this Mac-idiot! I am going to have a re-think, but have a cold or something so my brain is a bit porridge at the moment. Windows is my "home" system, and multi-simultaneous-runs are pretty easy to achieve. But I have not really developed on Mac since Intel came in, and the world has moved somewhat. I am downloading Linux Mint now and will set something up. More learning, on an old befuddled brain. If you don't want to bother supporting older versions of Windows, as of the anniversary release of Windows 10, Windows has a Linux kernel built-in, complete with Bash -- which means that you can write something for OS X and Linux using bash scripts, and it will run everywhere. Of course, while Windows 10 will now run ELF binaries, you still need to set up the entire environment to get it to work. Yes I have seen that, but not just yet, methinks. They are also saying the facility is not suitable for graphical apps, but I see others are already working on that. You can drag a VM on a copy of SheepShaver, or use 'Open with...' from the Finder's contextual menu, or you can create a script that will open each VM with a specific copy of SheepShaver. Use your imagination. The amazing thing about the sheepvm concept, as you have pointed out, is that you do not have to make a whole virtual machine. In fact, the only thing required in the .sheepvm folder is a file named "Prefs" - everything else can be elsewhere yet you have a unique prefs and resulting nvram file. EDIT. Multi Macs via sheepvm setups. Putting a strain on my emulated Yosemite! There are a lot to digest after my 2nd post. I think what I proposed here is essential to developers. For now, Mac users of Basilisk II are quite happy with what they get since they still have binary to run. If things doesn't work, they will search answers on Internet with luck. Most people like me, who doesn't own old Mac but want to fix it, can't compile nor develop for Basilisk II in Mac OS. 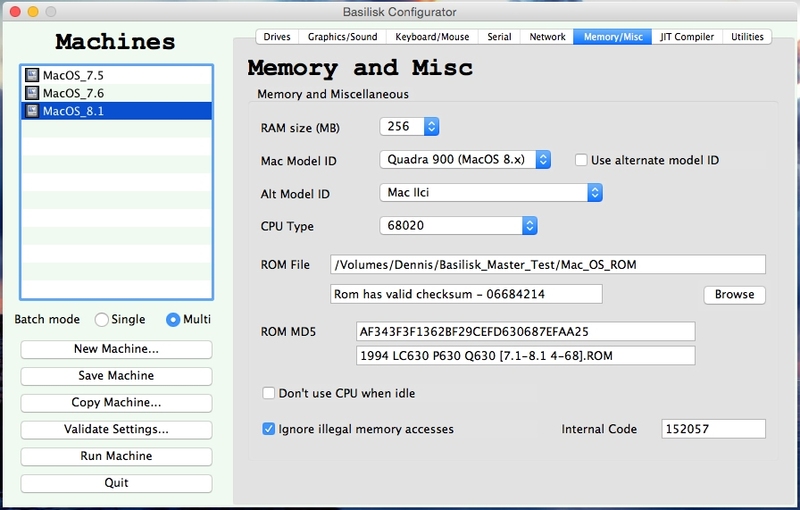 Sooner or later, the fate of BasiliskII will be similar to Sheepshaver -- it can't even execute in latest Mac OS. Nobody cares any more! 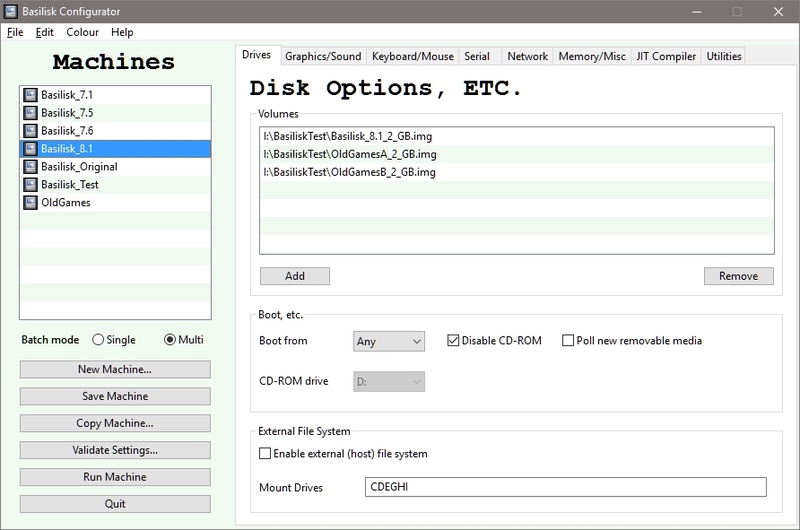 Basilisk II is a great open source project because it supports so many host OS platform. However, it is also open source development disaster because it has to maintain so many evolving host OS platform. I don't think we have enough resource to do that. Originally I thought BII compile failed in El Captain because of UI. Thus, I proposed a cross platform UI using modern tool. After all, UI just interface to configuration. But it turns out that there are more issues besides UI. Therefore, I propose to use Linux virtual machine to develop and distribute BII. I have written a vagrant script to build and make BII up and running. I need to test it further. Once it is stable and feasible, I will share with you all. In my past experience, I have to patch sheep_net from times to times due to Linux kernel change. I'm tired of doing this. So I think VM should be a better way. Many consider BasiliskII and SheepShaver to have no future, at least on OSX/macOS. Large parts of the code would need to be rewritten from the ground up. However, both BasiliskII and SheepShaver still run fine in latest OSX. For 68k Mac emulation, Mini vMac is in a better position to survive longer and is still actively being developed. For PPC Mac emulation, QEMU is the future. Lot of work is being done on it currently and progress is impressive. Last edited by Ronald P. Regensburg on Sun Aug 14, 2016 9:47 am, edited 1 time in total.